The Home Secretary has said he is "very concerned" about knife crime in the West Midlands days after two teenagers died in unrelated fatal knife attacks. 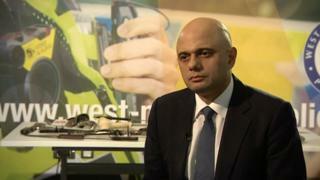 MP Sajid Javid made the comments in Birmingham after a 16-year-old boy died in Small Heath on Wednesday. Another boy, Mohammed Sidali, also 16, died in hospital two days after being stabbed outside his college in Highgate last week. Stabbings are "devastating communities" and "destroying lives", Mr Javid said. "It's important that we find out why and what's going on in our streets." According to the Home Office, the West Midlands has seen the third highest knife crime offences per head of population between April 2017 and March 2018. Last Sunday two other stabbings took place - one in Smethwick and another in Birmingham city centre. An 18-year-old was also attacked in Castle Vale last Wednesday. Earlier this month, the Home Secretary said he wanted to introduce new laws to stop social media being used to fuel knife crime.